Can We Stop Labeling Animal Activists as Terrorists? > Can We Stop Labeling Animal Activists as Terrorists? - the answer seems (unpleasant and) obvious: NO, we can NOT. btw: in Austria, animal-right-activists have been are ane procetoted using anti-mafia-laws. This week the New York City Bar Association withdrew a resolution submitted to the American Bar Association that urged Congress to repeal the Animal Enterprise Terrorism Act (AETA), in addition to urging the Department of Justice to stop any further prosecutions brought under it. 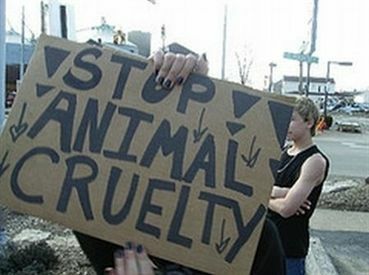 Originally known as the Animal Enterprise Protection Act of 1992, the AETA was passed in 2006 following the arrests of activists associated with the group Stop Huntingdon Animal Cruelty (SHAC) for doing nothing more than campaigning to shut down the notorious product testing facility Huntingdon Life Sciences. A number of agribusinesses, including the fur industry and pharmaceutical companies that have a financial stake in the continued exploitation of animals and was intended to target violent activities, lobbied for the act. However, numerous individuals and organizations oppose it because it�s overly broad, vaguely written, unconstitutional and has unfairly set its sights on law abiding citizens who want to speak out on behalf of animals. Under the law, if you protest peacefully or engage in other forms of civil disobedience or undercover investigations you could forever be labeled a terrorist. While it has a provision that is supposed to protect legal activities that are covered by the First Amendment, many, including the NYC Bar Association, believe that it�s insufficient when it comes to protecting citizens who want to raise public awareness about animal suffering. Causing damage to labs, fur farms or slaughterhouses might come to mind, but the law�s use of the term �animal enterprise� is overly vague. It covers every place that sells animals or animal products, including grocery stores, but at the same time doesn�t define illegal conduct, leaving both citizens and law enforcement confused about what people have a right to do. Sarahjane Blum, one of the plaintiffs, disagrees and believes she has been harmed by this law. �The AETA explicitly punishes causing an �animal enterprise� to lose profits, and I have spent years living in fear that the more persuasively I tell the truth about the animal suffering that underpins so much of our daily lives, the more likely I am to get thrown in jail,� she recently wrote in Truthout. While the AETA is supposed to target violent activities, it�s already been pointed out that we have laws on the books to protect individuals and businesses from harassment, trespassing and damage. This law doesn�t do much but make advocates afraid to bring attention to the atrocities animals are forced to endure for fear of being arrested and silence those who may otherwise spread information and start a dialogue with the public that might change minds and behaviors, while allowing the industries that continue to profit from their use hide behind the war on terror. The next time the NYC Bar Association will have the opportunity to raise issues about problems with the AETA is at the next ABA meeting in February. Hopefully the resolution will be reintroduced. Ultimately, animals feel the repercussions of such actions the most. Sign this petition to be an advocate for wild turtles to keep them out of turtle races and in their natural habitat. .. in Austria, animal-right-activists have been are are prosecuted using anti-Mafia-laws. Freedom of speech allows us to use our voice to help animals. We will not be silenced. Anyone who questions or challenges the 'powers that be' is deemed a threat, it seems. Highly ironic considering how utterly corrupt most of our not-so-glorious leaders are! The animal activist are heroes!